One of the commonest and most widespread of the olive snail family (Olividae), this species is found buried in subtidal sandy areas especially associated with coral reefs and lagoons. Although the diet of this species is not yet known, it is likely, based on our knowledge of related species, to include other gastropods and bivalves. 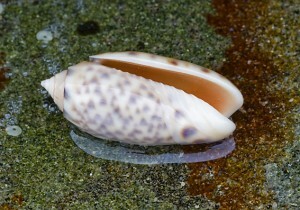 The highly glossed surface of the shell is entirely natural and is produced by the reflected mantle of the animal over the shell. Olives often spend much of their lives under the sand to minimise their exposure to predators, with only their siphons exposed above the sediment surface. This maintains a steady supply of oxygenated sea water for the gills and at the same time ensures continued chemo-sensory monitoring for the presence of possible food items. The foot plays a vital role not only in burrowing through the sand but also in the securing of living prey.